My Crappy Projects: Vennsday Thursday - Circles! Ovals! More Circles! 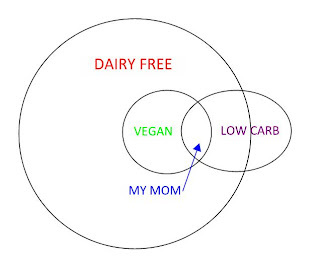 Vennsday Thursday - Circles! Ovals! More Circles! For two weeks, I had tiny little sketches of Venn Diagrams sitting on my desk, and I just didn't put them into a legible form. Until now. 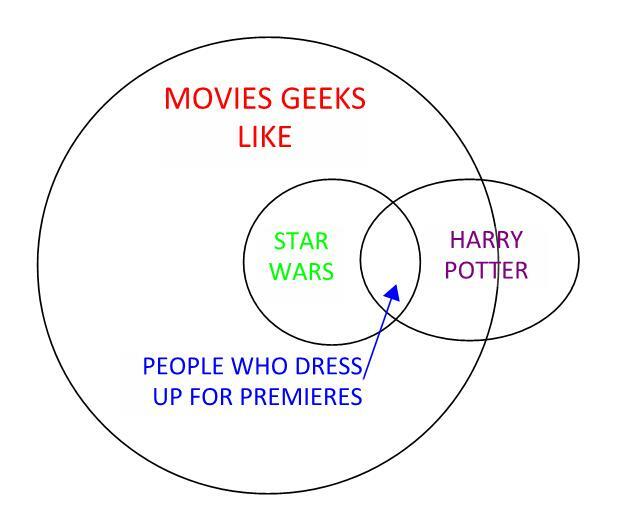 We'll learn about costumes, the definition of sadness (hint: it's the opposite of bacon), and how nature is awesome. Oh, you'll learn about some of my ridiculous fears, too. If only for that, read on! I confess, I have never been to a midnight premiere of anything. That sentence brings sadness to my heart. 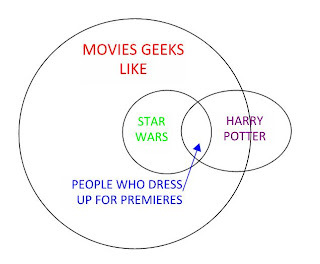 On the other hand, I'm probably never going to dress up to see a movie (unless it's in The Bloggess Style). Geeky question: Who wins in Jedi vs. Wizards? Grab a case of beer, and talk about that with your buddies. 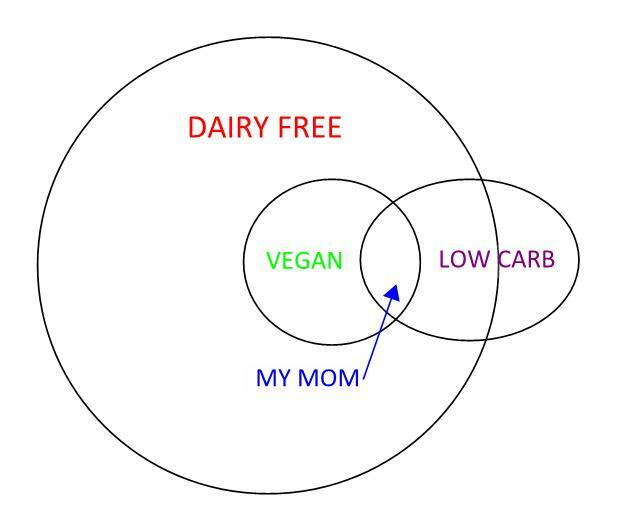 This Venn Diagram is like the circles of hell, or at the very least circles of sadness. Know what I love? Cheese. Know what else I love? Carbs, all of them. Even if I couldn't have carbs or cheese, I would still be happy because at least I could eat bacon. On the other side of the spectrum, there's my mom, who, I can only assume, cries herself to sleep every night with low-sodium tears. She told me she was going on a low-carb vegan diet, and I think I stared at her for three minutes silently before asking what she can eat. (Answer: kale and disappointment). "Swans are all the way in the "badass animals" circle and dinosaurs are only half in - what are you, high?"... is probably what you're saying right now. I stand by it. There are probably some non-badass dinosaurs, that like went around being vegan and worked as dinosaur accountants or something. 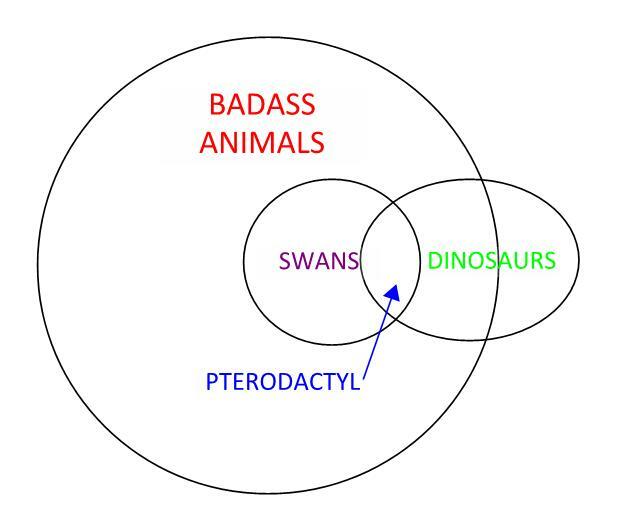 But swans, dude, swans are insane. They are territorial and their wings can break your leg. I'm serious. Do not mess with those motherfuckers. Sometimes I try to make super badass mythical creatures up, and today I was like "What if they mixed the scariness that is swans with dinosaurs, that would be INSANE" and then I realized... nature did that already! Nature is awesome. I hope it wants to be Facebook friends with me. Yesssss. The only thing scarier than a swan. Are you saying that your mom isn't a badass dinosaur because she's a vegan?!! My mom isn't a badass dinosaur because she lacks the scales and talons and fangs of a dinosaur. She IS a badass mom, though. In badass mom vs. badass dinosaur, my money goes on... well, probably badass dinosaur (see: scales and talons and fangs). She is definitely badass, please don't get her riled up. As much as I despise Kale, I heard a recipe for kale and spinach soup on the NPR Splendid Table that actually sounded very tasty. It would be much improved though, with lots of bacon.